The K4 and K5 art classes made cards for Valentine’s Day for the kids at Cincinnati Children’s Medical Center. It is great to see our kids learning how to be a blessing to others. 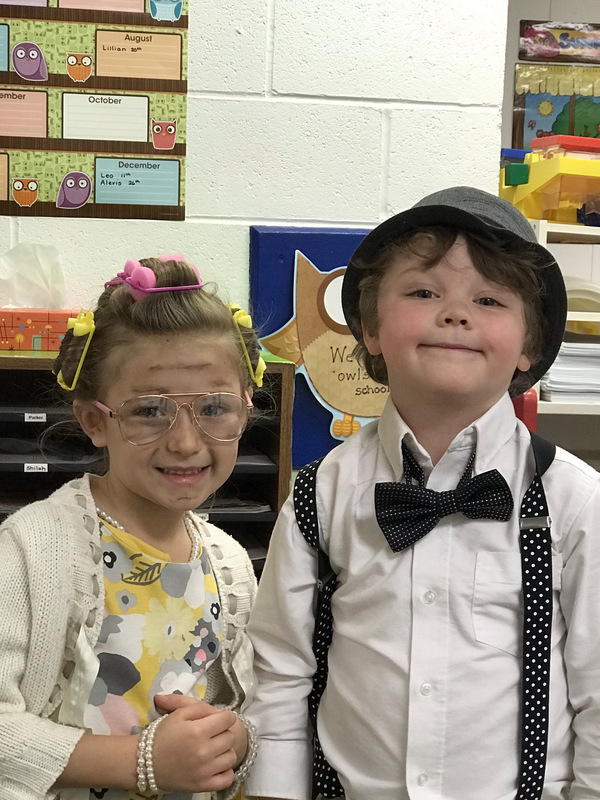 Our K5-2nd graders celebrated the 100th day of school on Friday. Students participated in many fun activities such as: stringing 100 Cheerios to make a necklace, making trail mix with 100 pieces of snack food, completing a puzzle that was 100 pieces, walking 100 steps, playing many 100 day games, and writing their names as many times as they could in 100 seconds. The favorite thing for teachers was seeing the children dress as 100 year old people. They were certainly adorable. 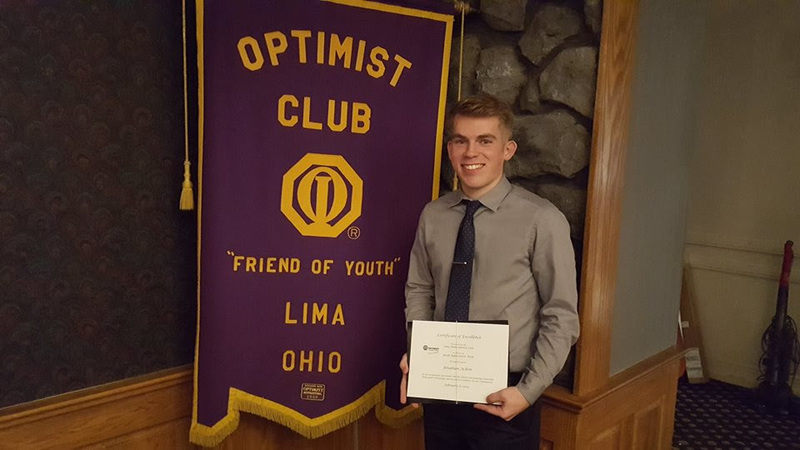 Congratulations to Jonathan Acklin for being awarded a Certificate of Excellence, presented by the Lima Noon Optimist Club in honor of Youth Appreciation Week! The purpose of the program is to recognize young people in the community for their leadership, good citizenship, community service, academic success, and school involvement. Jonathan was Temple Christian’s representative. Great job Jonathan! We would also like to congratulate Anna Acklin for being chosen as the representative for Teens for Christ. Great Job Anna! The 8th grade and freshmen Bible classes enjoyed a presentation today by local Christian radio station WTGN (97.7 FM). The students had helped with a mailing for WTGN as a service project, and WTGN wanted to personally thank them. 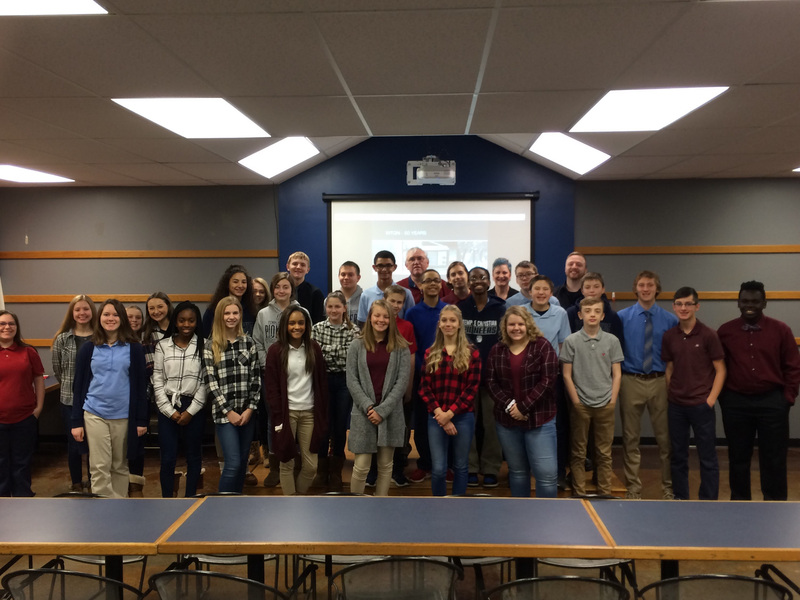 Students heard from general manager Scott Young and office administrators Jarred Slusher and Jennifer Faris about how God had personally led them into Christian radio. We appreciate WTGN for speaking at TCS today and for ministering the good news of Christ to Lima and the surrounding areas for over 50 years! 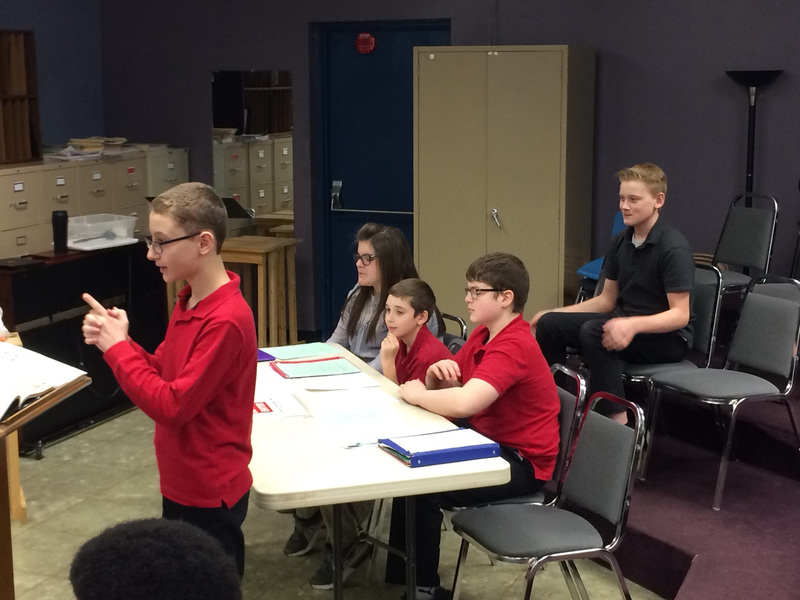 Seventh graders enjoyed conducting a mock trial today for Jack Jones from the story “Jack and the Beanstalk.” The students have been studying the judicial system and after much preparation, put their knowledge to use as prosecuting and defense attorneys, witnesses, judge, bailiff, and court reporter. 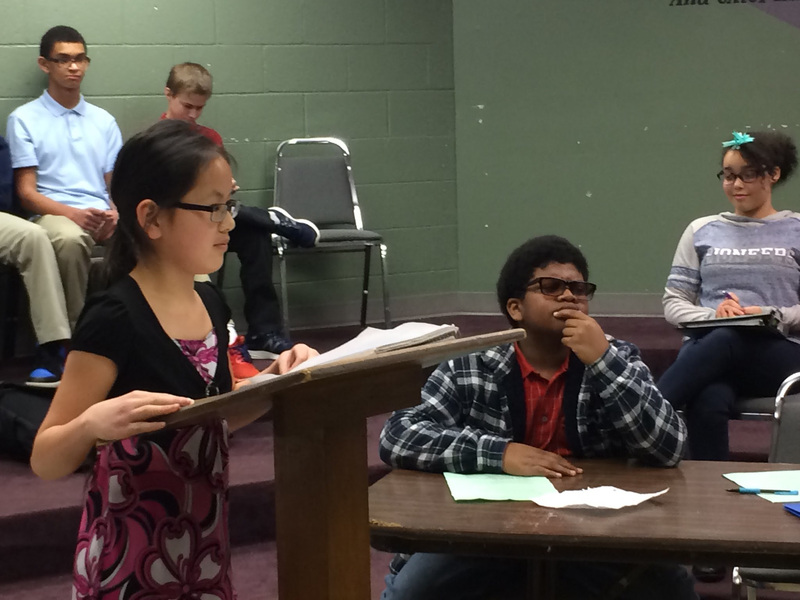 Thanks to the 6th grade class who served as the jury! The sophomore Bible class presented the story of the temptation of Adam and Eve to the elementary students in chapel this morning. 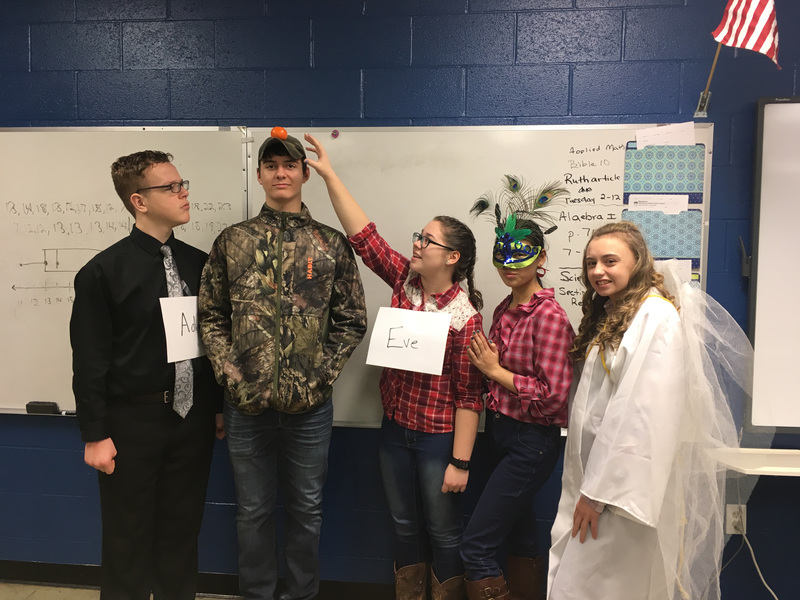 The sophomores used a skit to share how temptation comes in all kinds of packages and how we can have victory over temptation. God promised us in I Corinthians 10:13 that He will provide a way out. Adam and Eve made poor choices when faced with their temptation and consequently lived with the difficult consequences. We all need to ask the Lord to give us the strength to overcome temptation and make good choices in our lives. We were blessed to have six students from Heir Force Community School’s eighth grade class visit us on Wednesday Feb. 6th. They were able to attend our chapel, participate in classes, eat lunch, and interact with several of our students in a special question and answer session. We will have another seven or eight Heir Force students joining us this coming Wednesday Feb. 13th. The athletic department sent out a survey to K5-12th grades this week regarding spring athletic opportunities. Please take a few minutes to fill out the survey to assist the athletic department as it plans for the upcoming spring sports season. Here is the link for those that still need to complete the survey https://www.surveymonkey.com/r/MRVP6DY. We encourage our students to participate in our spring sports. We especially need our high school students to participate in track this year. The OHSAA requires all member schools to field two sports each season, so we need a boys and girls track team this spring. Thank you in advance for your participation. The elementary had a great turn out Thursday for our parent lunch with the K4-5th grade students. Thank you parents for making it a great day for the kids. 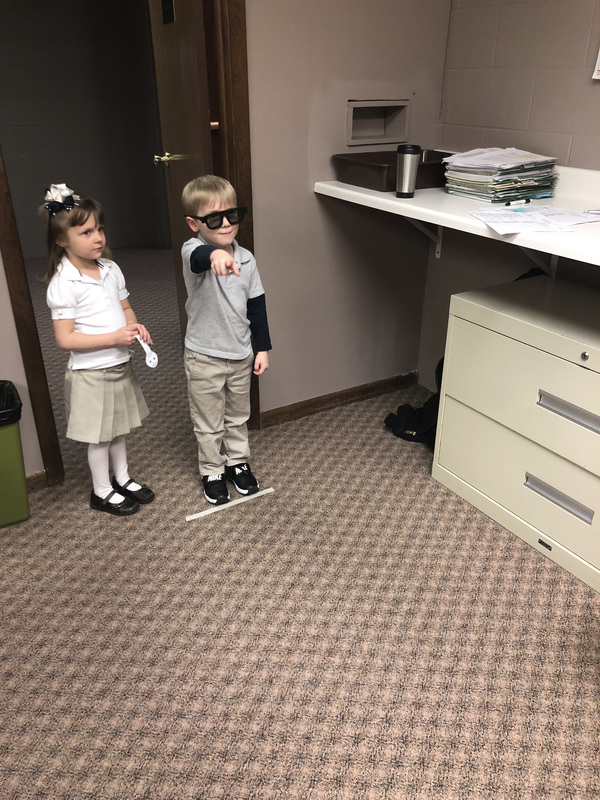 Temple Christian School conducts safety drills each year so that our teachers and students can be prepared for an emergency situation where we must lock-down the building and classrooms in order to ensure our children’s safety. We will be conducting a school safety drill on Wednesday, Feb. 13th. 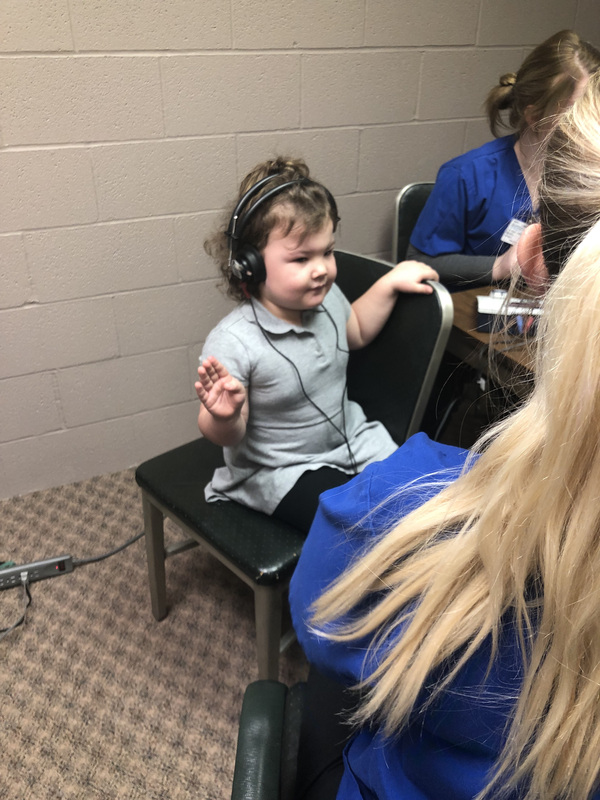 Rhodes State College Nursing students were at Temple this past Tuesday and Wednesday helping Mrs. Sweeney with our vision and hearing re-screenings, and scoliosis screenings. The nursing students are in their last semester of nursing school and have completed training on school health screenings. They were observed by their professor and our nurse Mrs. Sweeney. We appreciate their assistance this week. They are always a great blessing! How do good readers become great readers? Practice! Every spring we host a Scholastic Book Fair to make it easy to put terrific books in your child’s hands. This year’s book fair will be open March 5-8. As always, we are looking for volunteers to help set up, run and tear down the book fair. If you are available to help for a few hours that week, please contact Amy Link in the elementary office at 419-227-1644, ext. 1 or linka@tcspioneers.org. Thanks! Re-enrollment for the 2019-20 school year is scheduled to begin on February 11th. Thank you for choosing Temple for your children. We consider it a blessing to partner with you in your child’s education. Look for an email next week with all of the information and forms you will need for re-enrollment. Renewals for EdChoice Scholarships began on Feb. 1st. Please see Amy Link in the elementary office for information about renewing your EdChoice Scholarship. Sat. Feb. 9 J.H. Boys NWCC Tournament Game at Hardin Northern @ 10:00 A.M. Sat. Feb. 9 J.H. Girls NWCC Tournament Game at Hardin Northern @ 11:00 A.M.
Mon. Feb. 11 HS Bowling Match @ 20th Century Lanes vs. L.C.C. @ 5:00 P.M.
Fri. Feb. 15 Varsity/JV Boys Basketball at Lehman Catholic @ 6:00 P.M.
Fri. Feb. 15 HS Bowling OHSAA Sectional Tournament @ Astro Lanes in Wapakoneta @ 5:00 P.M. Sat. Feb. 16 Varsity/JV Boys Basketball at Ada @ 6:00 P.M. Sat. Feb. 16 HS Bowling OHSAA Sectional Tournament @ Astro Lanes in Wapakoneta @ 12:00 P.M.